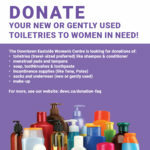 Thank you for your generosity in bringing your new or gently used donations to the Downtown Eastside Women’s Centre! We receive a high volume of emails and calls inquiring about donations and unfortunately cannot respond to them all. To best ensure we meet women’s needs, please read the following FAQ before calling or emailing us. When space is available, we always accept the following items. Bold items mean we’re running low and your donations are especially welcome. This page will be updated according to our needs. Please click here to find a list of other organizations that may accept items not on our wishlist. I have a large donation (a full vehicle or more), or I would like to run a donation drive. Please get in touch before dropping off a large donation or planning a donation drive. We appreciate your generosity and your understanding, as we have limited storage and can only accept certain amounts at a time. How should I bring my donation? Please bring your donation in boxes or bags, ready for drop-off. We do not have containers on site to hold donations and cannot return your reusable bins. Thank you! We are located at 302 Columbia St, on the corner of Cordova St: the grey unmarked door underneath the Downtown Eastside Women’s Centre sign. You’ll be able to spot our building by its colourful mural, painted by community artists. There is street parking available on Columbia St. and Cordova St. as well as a parkade on Cordova. If you cannot find parking right next to the Centre, come in and ask staff to assist you in bringing your donation inside. We have a trolley we can use for larger donations. Can men come inside to drop-off donations? No, we are a women-only space. If men are dropping off donations, please ring the doorbell and inform staff you have donations to drop off. Thank you for your understanding and for cooperating with this policy. We are also closed on February 14, 2019 (Valentine’s Day) for the Women’s Memorial March. 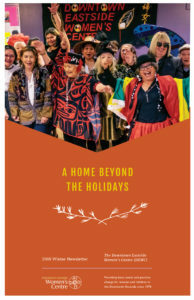 Thank you for supporting the Downtown Eastside Women’s Centre! 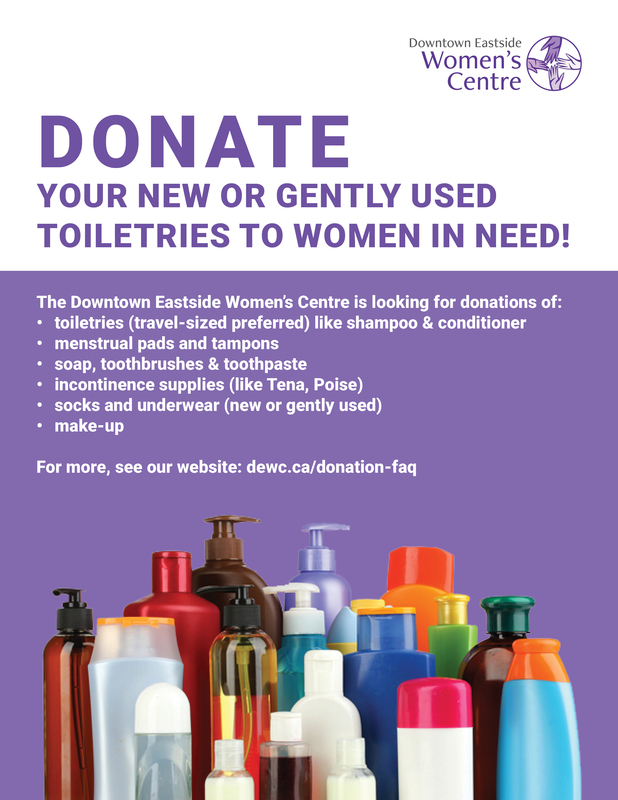 It is due to donors like you that we can provide essential needs to women of the Downtown Eastside. Click the image to download our donation wishlist graphic!